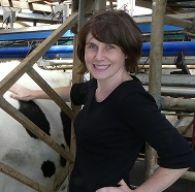 Dr Megan Verdon is a Research Fellow at the Dairy Centre in the Tasmanian Institute of Agriculture. Megan has experience in animal behaviour and welfare, and is undertaking research into virtual fencing for dairy cows. Before joining the University of Tasmania, Megan was a Postdoctoral Research Fellow at the Animal Welfare Science Centre at The University of Melbourne, where she also completed her PhD studies. Megan’s research aligns to the University’s research theme of Environment, Resources and Sustainability. Her research interests include understanding the complex relationships between social behaviour, welfare and productivity of animals. Her previous research has demonstrated that, while an individual animal may have a general tendency to deliver more or less aggression, they may also display flexibility around this general ten­dency depending on prior experiences and the environment (including the social environment). Megan believes that recognising the social needs of production animals and manipulating the commercial system to support the natural development and expression of social behaviour will achieve continued advancement in animal welfare and productivity. Megan has published six research papers in peer-reviewed journals, and has presented at seven scientific domestic and international conferences. She is first author on a literature review that was the 8th most frequently downloaded article from the prestigious Journal of Animal Science in 2015. She has just completed a book chapter on aggression in commercial pigs that will be published in 2017. She regularly reviews articles for the journal Applied Animal Behaviour Science. In total, Megan has attracted over $253,000 of funding through scholarships, awards and competitive grants.This includes three successful industry projects and the 2014 Australian Federal Government’s Science and Innovation Award for Young People in Agriculture. Megan’s current research involves a large industry and multi-university collaboration that is largely funded through the Australian Government’s Rural Research and Development for Profit programme. This project aims through the use of virtual fencing/herding technology to improve the productivity and profitability of livestock enterprises through optimising the management of individual grazing animals and better matching their requirements with feed availability. Megan has successfully supervised three Masters students, is on the advisory committee for one PhD candidate and co-supervisor to a second. She hopes to find a PhD candidate who is enthusiastic about social behaviour and animal welfare to work within her current research program that is investigating virtual herding technology in dairy cows.